In July of 2016, little Braden Luke Scott of Beaumont caught a cold. Only days later, he could not move or swallow, and soon after stopped breathing. He was eventually diagnosed with Acute Flaccid Myelitis, leaving him paralyzed due to a direct viral attack to his spinal cord. After over six weeks at a Houston hospital, he was transferred to an inpatient rehabilitation in Dallas for fie months. 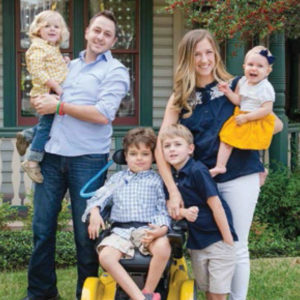 Since then, his parents Sol and Rachel, his siblings Keaton, Finley, and Merritt, his extended family, other loved ones, and dedicated medical staff have worked tirelessly to get Braden strong, moving, and back to being an active little boy. A portion of the funds raised at the 2018 CFST Clays for Cardio Shoot-Out will go to the Scott family to help them with Braden’s medical expenses. The CFST is a qualified 501(c)(3) tax-exempt organization and donations are tax deductible to the full extent of the law.